Planting a vineyard and installing trellis wire and posts are major investments; it is best to get it right from the very beginning! Rule #1 - Sunlight interception is the key ingredient to quality grape production! Buds require adequate sunlight to develop through the first 6 of 15 developmental stages; the final stages are completed during the following growing season (Figure 1). Figure 1. Concord Bud Development. Cluster initiation (arrows) in green shoots begins just after bloom, and by just before veraison, the buds reach stage 6 of 15. After the winter dormancy and bud break the following season, buds pick back up and finish developing via shoot emergence and growth by bloom, at which point the cycle begins anew. *Dates on x-axis are approximate for each season. Adapted from Goffinet, Wine East 2001. Site selection and vineyard row orientation, width, and length should all be planned with maximum sunlight interception in mind. Assuming the site is amenable for wine grape production - soil water and air drainage are adequate and temperatures are moderate - the next mission is to plant the vineyard on the slope that receives the most sunlight. Planting across slopes, where possible - and potentially with a cover crop, is often recommended to reduce erosion problems with spring and summer rains (Figure 2).If practicality dictates that rows be planted parallel to the slope, allowing a cover crop, grass, or resident weeds to grow in the row middles can reduce the likelihood that the soil at the top of the hill does not end up at the bottom of the hill. Figure 2. 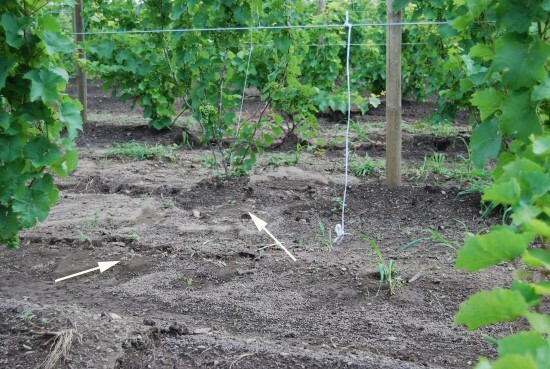 Vineyard soil erosion. The lack of a cover crop in this vineyard allows soil to be washed from the top of the field through the rows. Note how the crowns of the plants are above the surrounding soil lines within the rows (arrows). In rows oriented north/south, vines tend to have more even sunlight distribution in our region. Several studies (and plenty of anecdotal evidence) demonstrate east/west rows tend to have uneven ripening or quality issues in regions with cool climates, especially the Northeastern US. Frequently, the site itself will often dictate in which direction rows can be aligned. For example, if a site allows for either numerous, short north/south-oriented rows or longer east/west rows, one should opt for the latter. Above all, however, one must consider the practicality of row orientation and length within the confines of a particular location, especially while considering the necessity of headlands and turning space for vineyard tractors, harvesters, and other equipment. 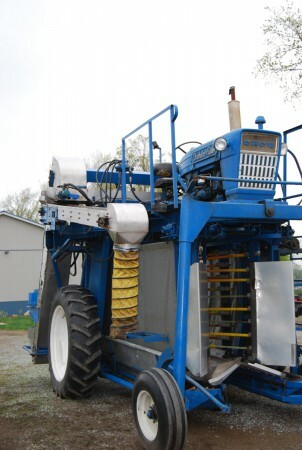 Row spacing must accommodate equipment that will be used in the vineyard and vice versa. Frequently, to maximize sunlight interception within the confines of a particular site, rows and vines are spaced more closely together to increase the number of vines per acre. 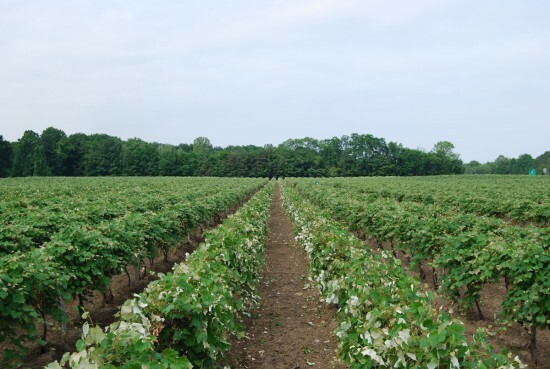 With vine spacing, there are several factors to consider: 1) sunlight interception, 2) space for adequate growth, 3) site vigor, and 4) number of vines per acre. More vines = more work. One must make sure vines have adequate space for vigor of site to ensure they are not enclosed in a flower pot. Overly vigorous sites might require that vines be widely spaced to encourage vigorous vines to fill a larger canopy, or vines with minimal vigor may need to be planted closer together to fill the canopy completely to maximize sunlight interception. Figure 3. Row width and height will affect sunlight interception by the canopy during various periods of the day (From Bob Pool's Grape Pages). Table 1. Vine Spacing Chart. This chart guides growers to determine number of vines needed per acre once vine and row spacing has been determined. 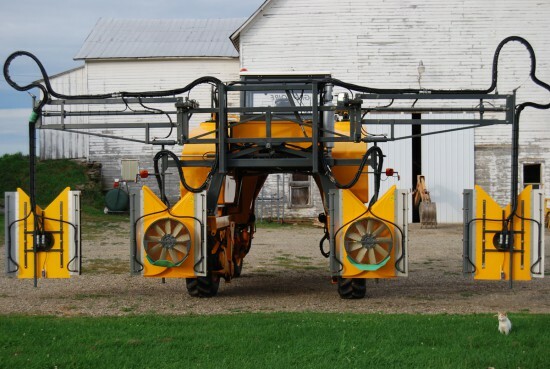 While it is best to maximize row length to be more efficient when spraying and scouting in the vineyard, be sure to include headlands, aisles, drives, or breaks in the rows for mechanical access and to reduce boredom. 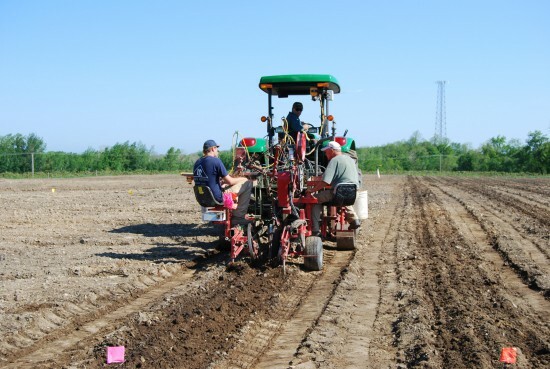 (Figures 3 and 4) Be sure rows are straight; this can be done using the Pythagorean Theorem (a2+b2=c2) (Figure 5), or one can hire a group that does laser planting (Figure 6). Straight rows not only maximize use of the total acreage, they can also reduce damage to vines planted out of sync with neighboring vines. Figure 3. Concord rows in June. Long rows can make your operation more efficient and maximize the use of the land, but it is important to have breaks or headlands for equipment/mechanical access and to relieve boredom! And allow for space in treelines. Figure 4. Mechanical harvesters (top) and multi-row sprayers (bottom) require 30-40' to be turned in headlands. This equipment is only economical for large acreage operations. Figure 5. Using the Pythagorean Theorem (A2+B2=C2) in real time and space can enable a grower to plant straight rows. Figure 6. Laser Planting. While laser planting may hold a higher initial price tag, straight rows will pay off in the long run, with fewer vines damaged by equipment. Starting with soil maps of even maps from any satellite service (Google Maps), Bing Maps, etc. 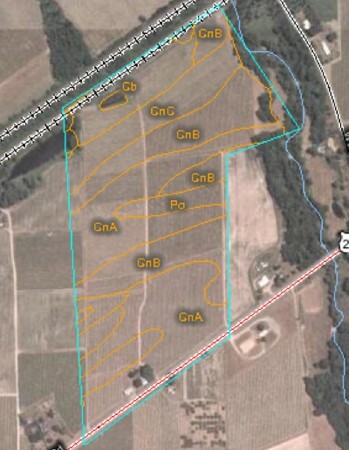 ), a grower can easily develop a block-by-block vineyard map system (Figures 7 and 8). These maps can be saved and used in the future for scouting (LINK), canopy management trials, vine and post replacement, and nutrient management, just to name a few. 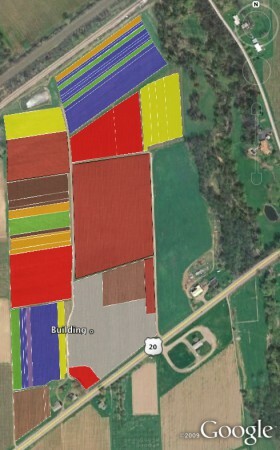 Plus, having maps of different vineyard blocks owned by one farm will facilitate better organization among employees, especially if the business grows significantly. Figure 7. Google Earth (http://earth.google.com/) map of the Cornell Lake Erie Research and Extension Laboratory vineyard blocks. Figure 8. Use the USDA Web Soil Survey (http://websoilsurvey.nrcs.usda.gov/app/HomePage.htm) site to create a soil map of your site. Goffinet, M.C. 2001. Grapevine buds: construction, development, and potential for cropping. Wine East Magazine, Sept.-Oct., pp. 14Ã¢ï¿½ï¿½23. L&H Photojournalism, Lancaster, PA.
Winkler, A. J., J. A. Cook, W. M. Kliewer, and L. A. Lider. 1974. General Viticulture. University of California Press.